The economy is performing better that the stress test baseline scenario for GDP and house prices, but worse than the "more adverse" stress test scenario for unemployment. 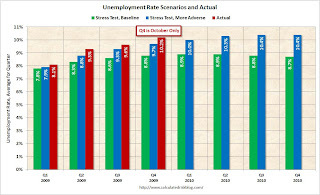 This graph shows the unemployment rate compared to the stress test economic scenarios on a quarterly basis as provided by the regulators to the banks (no link). This is a quarterly forecast: the Unemployment Rate for Q4 is just October at 10.2%. The unemployment rate is higher than the "more adverse" scenario, and much higher than the peak of the baseline scenario. The DOL report yesterday showed seasonally adjusted insured unemployment at 5.75 million, down from a peak of about 6.9 million. This raises the question of how many unemployed workers have exhausted their regular unemployment benefits (Note: most are still receiving extended benefits, and President Obama signed a further extension of benefits this morning). 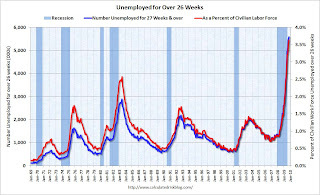 The blue line is the number of workers unemployed for 27 weeks or more. The red line is the same data as a percent of the civilian workforce. The third graph shows the BLS diffusion indexes for total private employment and manufacturing employment. Think of this as a measure of how widespread the job losses are across industries. The further from 50 (above or below), the more widespread the job losses or gains reported by the BLS. 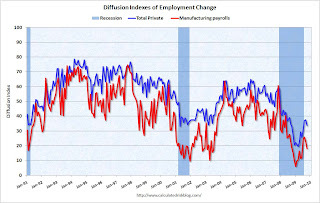 Both the "all industries" and "manufacturing" employment diffusion indices had been trending up - meaning job losses were becoming less widespread. However both turned down in October. This series is noisy month-to-month, but it still appears job losses are widespread across industries. Employment Report: 190K Jobs Lost, 10.2% Unemployment Rate for graphs of unemployment rate and a comparison to previous recessions.